If people's life feels like it is lacking the power that they want and the motivation that they need, sometimes all they have to do is to shift their point of view. Maybe balancing electric unicycle is not popular among the family and it only has a limited group of enthusiasts. But if people open their minds to accept this product which seems a little strange when compared with normal vehicle. They may find the different surfing experience than that of skateboarding or something similar. As the name implies, the power of this skateboard is offered by battery pack. With this great improvement, Fosjoas motorized skateboard K1 owns the biggest advantage over traditional ones - that totally changes the skateboard from the toy to the tool. What's more, Fosjoas K1 is not the novelty only belonging to the young, but also for mid-aged people. Users can be from different professions and at different ages only if they are young-hearted. 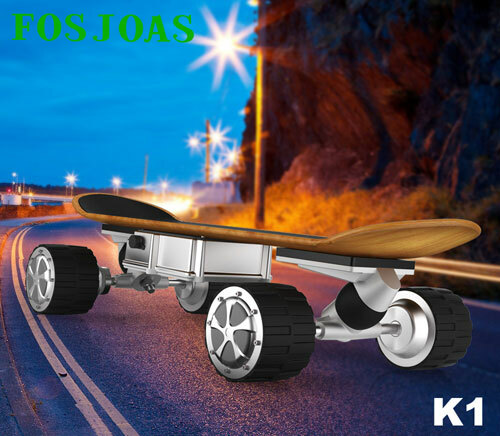 Of course, Fosjoas skateboard K1 not only has the beautiful and strong contour design, but also unbeatable in the performance of all components. To make the riding more smooth, the front and rear wheels are equipped with PU material damper mass. Hence, the riding experience will be more wonderful. Besides, Fosjoas K1 uses Cheng Shin Tire which has better skid resistance and stronger grip effect to guarantee riders' safety and smooth surfing. Developers also foresee the problems that may happen in the half way, so they make a vital decision - let each module work independently. Consequently, even a single module has problem, the whole system can work normally and efficiently. With this design, Fosjoas K1 is much stronger. People who have interest in Fosjoas cheap electric skateboard K1 become more and more. What they are interested in is not only the perfect design and performance of K1, but only the new life style and the new era of motorized skateboards. Everyone wants to be cool, doesn't he?